Citing a "lot of hard work done by Seattle citizens and neighborhoods," Mayor Paul Schell and several city councilmembers gathered yesterday to tout the city's vision for development around Sound Transit's Link light rail stations. The station area planning recommendations were adopted by the city last month. Photo courtesy the City of Seattle. 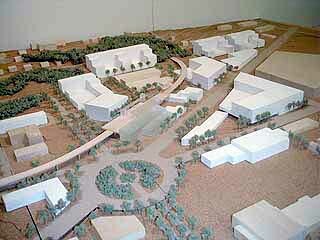 This model of the McClellan station area shows a mixed-use, town center. A number of areas adjacent to the elevated station are designated as development opportunities. With councilmembers Richard Conlin, Jan Drago and Richard McIver beside him, Schell said it is Sound Transit's job to build Link itself but, "It's the city's job to be sure that it's done right." Doing it right, said Schell, includes planning what happens around each of the stations in terms of retail, housing and jobs, as well as figuring out how to connect the rest of the city to the system. Link light rail is planned to open in 2006, with construction beginning this spring. The 24-mile line includes 15 stations within Seattle city limits as part of the nearly $2 billion project. Two of the 15 stations, Beacon Hill and Royal Brougham, would be deferred until a later date. The Seattle portion also includes the estimated $500 million tunnel from downtown to the University District. Sound Transit is currently negotiating a design-build contract for the tunnel, after bids came in substantially higher than budgeted. Councilmember McIver said that the kind of land use planning going on in conjunction with Link will "stimulate the dreams of southeast Seattle." Sound Transit has approved a $50 million community development fund for the Rainier Valley to influence development along Martin Luther King Way South. McIver said that the fund, along with Sound Transit, will help "achieve those dreams for the people living there." After two years and untold meetings, the station area plan recommendations reflect the stated desires of each station neighborhood. Each plan is "a refinement of the urban village" concept already in place, said Mayor Schell. In essence, each station is the subject of a mini-comprehensive plan specifically geared toward the challenges and opportunities that light rail will present. The plans themselves, available from the city's Strategic Planning Office, identify development opportunities within each station area where growth is to be directed, albeit in a conceptual manner. Also identified in the plans are existing institutions, attractions and developments that form the fabric of each station area. In the McClellan station area, for example, existing "trip-generating" land uses include Franklin High School and the QFC grocery at Rainier Avenue South and South McClellan Street. Also mapped, however, are a number of areas immediately adjacent to the planned elevated station that are designated "development opportunities." In the text, and in a model of the area created by the federally chartered mortgage lender Fannie Mae, these development opportunities are envisioned as a town center-type mixed-use development. Also envisioned is some type of traffic circle between Rainier Avenue South and MLK South that would serve as a landmark. Zoning that would establish overlay districts and some re-rezoning around each of the stations is expected to be enacted sometime in early 2001. The zoning would establish the ground rules for development around each station in hope of fostering each neighborhood's planning goals. One provision will be not allowing new auto-oriented uses--drive-ins, parking lots, etc.--adjacent to the stations. The station area planning recommendations are available from the Seattle Strategic Planning Office (206) 684-8080. Less refined versions without many of the written analyses are available on the Web at http://www.ci.seattle.wa.us/planning/SAPatlas.htm. The overlay ordinance was recently dealt a setback when it was remanded to the city's Department of Construction and Land Use for further study by the city's Hearing Examiner. The appeal to the examiner had been brought on environmental grounds by a number of groups, including Save Our Valley, which had sought to have light rail tunnel beneath Martin Luther King Way South. Councilmember Conlin stated simply, "Light rail is in the Rainier Valley because people asked for it." D'Anne Mount of the city's Strategic Planning Office said these large scale planning programs undertaken by her department "set the stage for not only public investment, but also what we think is going to be some pretty amazing private investment." The city's goal is relatively straightforward, said Mayor Schell: "Let's make each investment stimulate three or four others."